Even though Hawaii is a destination that boasts many repeat visitors, there are a few factors that tend to keep some families away — costs and travel time. While there's nothing you can do about the fact that you'll need to fly to the West Coast, and then take another five to six hour flight to Hawaii, you can take some steps to reduce or eliminate at least some of the costs associated with your trip. 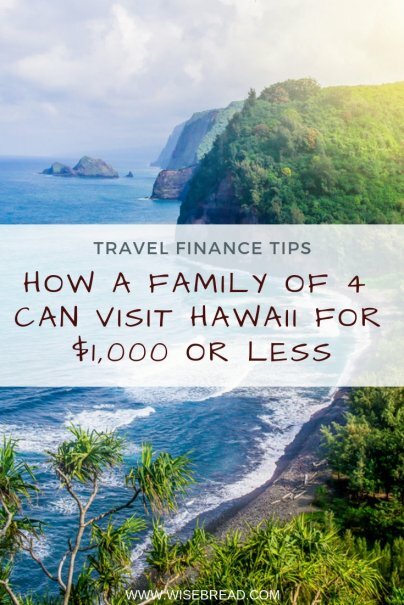 Here's how a family of four can get to Hawaii for $1,000 or less. Korean Air: 25,000 to 30,000 miles round-trip in economy, depending on the partner you fly with — Delta, Hawaiian Airlines, or Alaska Airlines. There are other airlines that let you fly to Hawaii with rewards, including Singapore Airlines and British Airways. Southwest Airlines has also announced its intention to offer flights from some California cities to Honolulu (Oahu), Kahului, (Maui), Kona (Big Island), and Lihue (Kauai) in the near future. They're planning on offering inter-island service, too, so keep an eye out for those program details. If a family could rack up 100,000 rewards points in sign-up bonuses and some additional points through regular spend, they could book four round-trip flights to Hawaii with one of these airlines. The best part about flying to Hawaii with miles is that, because it's a domestic destination, you won't see the big fuel surcharges often levied on international. Instead, you'll pay the government-mandated taxes and fees levied on domestic flights, which works out to $5.60 per person, per leg. If you rack up enough airline miles and pay the taxes and fees for each leg, a family of four visiting a single island could wind up spending less than $50 on flights. The good news about lodging in Hawaii is that while it's an expensive destination to visit, there are plenty of hotels and resorts you can book with hotel points. Doubletree by Hilton Hotel Alana, Waikiki Beach with as few as 47,000 points per night. Hilton Garden Inn Waikiki Beach with as few as 50,000 points per night. Hilton Hawaiian Village Waikiki Beach Resort with as few as 60,000 points per night. Hilton Garden Inn Kauai Wailua Bay with as few as 45,000 points per night. Hilton Waikoloa Village with as few as 60,000 points per night. Grand Wailea, a Waldorf Astoria resort with as few as 95,000 points per night. If a family was able to rack up 200,000+ Hilton Honors points by signing up for co-branded Hilton credit cards, they could potentially book five nights for free at some of these properties. That's because Hilton Silver, Gold, and Diamond members can score a free fifth night when they book four consecutive nights with rewards points. Also keep in mind that you don't have to use rewards to book a stay at a fancy resort. There are notable downsides for doing so, including the fact that resorts tend to charge sky-high prices on everything from souvenirs to food and drink. As a guest of a resort or name-brand hotel, you may be forced to spend more on basics since you're a captive audience. If you're worried about overspending on food and extras at a resort, you should consider booking a rental condo for all or part of your trip. With this strategy, you could potentially have a little more space — and even a separate bedroom for the kids. You could also book a condo with a kitchen, then plan out some meals to make at home to save even more. At the very least, it's fairly easy to buy ingredients for morning coffee and breakfast so you can avoid one meal out each day. If you could pay less than $50 for your flights, cover lodging with hotel points and flexible travel credit, and keep your food and adventure spending in check, you could easily take part in a Hawaiian vacation for $1,000 — or even less depending on how much you spend on food and fun. If you're aching to visit Hawaii's famous beaches, hike up a volcano, or enjoy a luau with the family, the best time to start planning is now.